Taormina, situated on the slopes of Monte Tauro, is a popular vacation spot especially in summer and renowned for its spectacular views of Mount Etna. The beautiful natural surroundings together with the nearby coastal towns along the Ionian Sea make this stretch one of the top destinations in Sicily. 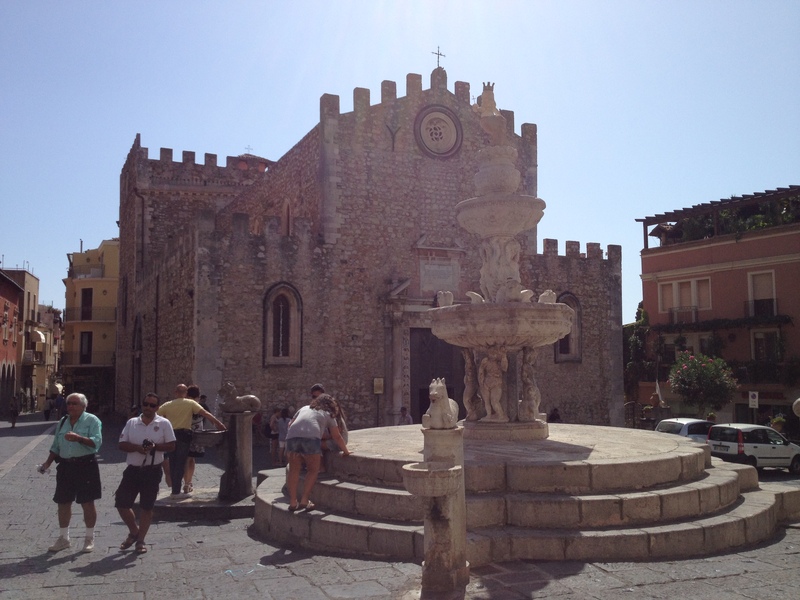 Here are some of our favorite places to visit in Taormina and the nearby coastal towns. 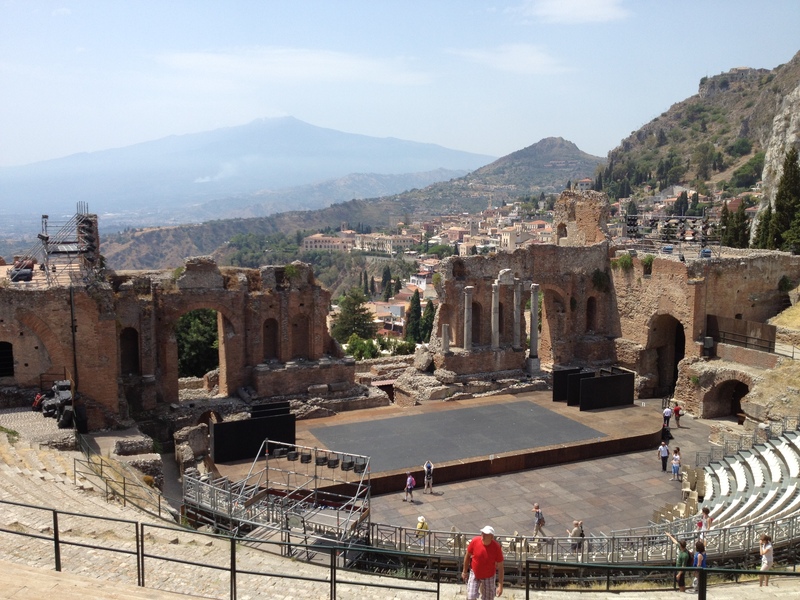 The main attraction in Taormina, the Greek theater is the second largest in Sicily after the one in Syracuse. The original building dates back to 3rd century B.C and was enlarged by the Romans in the 3rd century A.D who transformed it into an amphitheater. It was divided into three sections, the orchestra, the stage and the cavea (auditorium) which could accommodate 5,400 spectators. With its exceptional acoustic, this theater still hosts summer concerts annually. The location, with sweeping views of the coastline and the impressive Mount Etna in the background, provides a magical atmosphere and makes for an unforgettable experience. In this picturesque piazza, you will find the Duomo built in Gothic style and the Baroque fountain. Dedicated to St. Nicholas, the Duomo was originally constructed in the 13th century but has undergone extensive restoration work over the centuries. Its interior is a Latin cross with a nave and two aisles which are supported by six monolithic pillars. Step inside to see the “non-made” Madonna with a silver mantle. Hidden in a well from Arab invaders, it is so-called to illustrate that it is a miraculous icon not made by humans. Extremely popular and rightly so, this elegant piazza offers a splendid view of the Greek theater, the bay of Giardini Naxos and the formidable Mount Etna. This terrace-like piazza attracts crowds that congregate near the railings to admire the spectacular views and take the opportunity for a photo shot with this priceless backdrop. In the piazza, you will also find the Church of St. Joseph and a former church, St. Augustine which has been turned into the town library. North of the piazza, the clock-tower dates back to 12th century and is a reconstruction of the original one destroyed during the French invasion in the 17th century. So what took place on 9th April for the piazza to be named after this date? It was on this day in 1860 when news was received that Garibaldi had landed at Marsala to commence the liberation of Sicily from the Bourbons and thus the piazza was so-called to commemorate this date. You may be thinking that the name Naxos doesn’t sound Italian at all. You’re absolutely right as Giardini Naxos, founded in 735 B.C, was the first Greek colony in Sicily and named Naxos after an island in the Aegean sea. During the Byzantine period, the cultivation of citrus fruits was introduced by the Arabs and hence the name Giardini (gardens). Today it is a popular beach resort with a 2.5 mile-stretch of sandy beaches which makes it a bustling town in summer. The most fascinating sight here is the group of rocks known as the Islands of the Cyclops or Faragilioni of Acitrezza created by lava eruptions in the Gulf of Acritrezza. However, a more intriguing story according to legend was that these rocks were thrown by the cyclops Polyphemus at Ulysses after being blinded by him with a stake through the eye. Since 1989, the islands with rich fauna, beautiful landscapes and abundant presence of fossils have become a protected marine reserve. One of nine towns that bear the name “Aci”, the presence of the 12th century Norman castle situated on a rock gives this place its name Aci Castello. Fortified since Roman times, the castle had its share of events from witnessing the struggles between the Aragonese in Sicily and the Angevins in Naples to serving as a prison under the Bourbons in 1787. Today, it is a museum that contains archaeological remains as well as a small botanical garden. Check out the video of what we came across while exploring Aci Castello! This lively scene gives you a feel of local life and traditions in Sicily.